The new covers are really great samit,so the manticore’s secret will be out on the 14 of dec?…my parents will be visiting me then so I can have them pick up the latest copy on there way here! WAY COOLER THAN THE SIMOQUIN COVER! looks very dark and brooding…. was that Qianzi by any chance??? You must be so proud and excited. Very nice! Nicer than Simoqin, I feel. Reminds me a bit of LOTR somehow. This picture does not speak a thousand words – it sets them on fire. great! stupid question but will the book be avaliable in UK that day, week? look forward to it..very much! amazing. now let it just materialise. then happiness will be complete. Looks fantastic, but … a dragon? Don’t you think that is a bit cliché? The original Simoqin cover looked somewhat different. This looks like slightly generic, which the book itself probably won’t be. Loved the new Simoqin cover, though. Fabulous. I hope the ‘Gameworld’ name will be clarified in this book. I am intrigued. Why ‘Gameworld’? When are you coming to Cambridge, MA for a book reading? Very exciting! I just finished The Simoqin Prophecies, so looks like I timed it just right. thanks v much all of you. 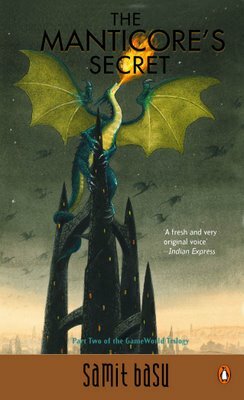 aditya: yes, a dragon on a dark tower is a rather stereotypical image. which is exactly what i enjoy most about it:) you should also be able to identify which dark tower this dark tower looks like. anupreeta: find me a publisher, no? Why GameWorld will, I trust, become clear in due course. Agree with Aditya. The dragon/dark tower association is a bit cliched. But maybe that’s because there aren’t many Indian titles in the genre yet. 🙂 horntails were black, no? the green ones were norwegian ridgebacks. this one, i dont know..its a Lukuchorian Limeskin? Nah, dont think so. Hi Samit – congratulations, the cover looks beautiful. All the best for the coming D-Day. I am sure the excitement has begun. Have a great launch. Nice cover. The dragon reminds me of the Hobbit cover though… the Ballantyne Anniversary one. Can’t eait to buy the book. Congrats! I need to re-read Simoqin now. When it will hit the stores in Chennai! And when in the USA!! Can I get it from Amazon.com. Looks like you can get Simoqin from amazon.com. lovely cover… am a great fan of your writings… when’s manticore releasing in cal? chetan: thanks a lot. send me some of your readers, wont you? Again, thanks a lot everyone who posted here…youve saved me from becoming a nervous wreck, though whether thats a good thing only time will tell. Guru, Delhi aschhi. Sadly, will miss your book launch. Kintu ekta autographed copy chaiyee, chaiyee! found out about your existence today. surprising that i hadn’t earlier. am telling my small world about it. I agree with the empress. its sexay. As opposed to ooglay. I’m a regular ableit clandestine reader of your blog, and just wanted to congratulate you on the forthcoming release of the sequel to simoqin. I look forward to reading it. This has been a good quarter- Jordan, G.R.R and Samit Basu all bring out their much awatied sequels.